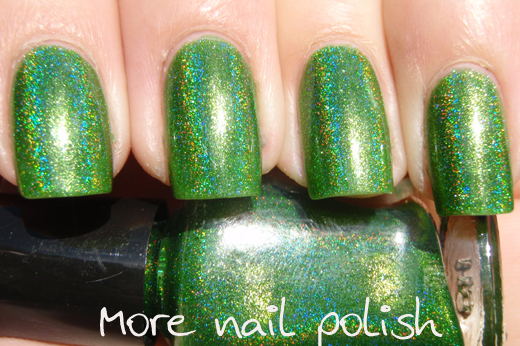 I have another custom polish for you today. Again I don't want to call this a franken, because it's not actually made from the parts of any other polishes, it's made from all new ingredients. 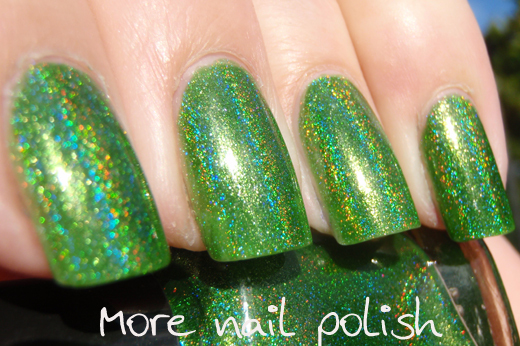 As you can see, this is a strongly pigmented rich green holo. I wore this for a couple of days last week and it really was rather spectacular. Because it's not your everyday colour I got so many comments on it! I also played a round of golf on friday at our corporate golf day and my boss even asked if I specifically put on this green polish because I was playing golf. Because of that, I've called this one "Fairway Green"
So what's so good about them?, well you just need to take a look at the bottom of a bottle of polish. Take this bottle of China Glaze LOL for example. The important colour information is listed at the bottom. 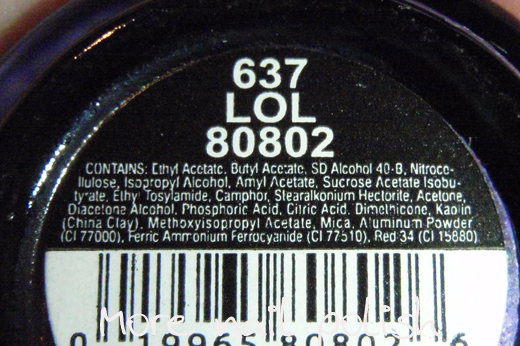 The color in LOL is made using a combination of Ferric Ferrocyanide and Red 34. I just need to keep tweaking the quantities of each one until I get the polish colour to match!! The Fairway Green polish above was made using Ferric Ferrocyanide, Yellow 10, spectraflair 1500-35 and suspension base. I can't express how much fun I have playing mad scientist with all this stuff. wow, that's a gorgeous polish! never seen sth like that before! That is amazing and awesome and I need that polish in my life! Did I miss the info on the tints? Like where to buy and such? Wow! this color is gorgeous! Do they have an official name? Anything on the bottle? I can maybe track something like that down here in the US. Thanks! I've never seen anything like this in my life! and their tips on how to identify the colors of polish, it was amazing! Oooh! I agree with KrisinPhilly. Please share the recipe with us, name of tints and name of Aussie supplier. 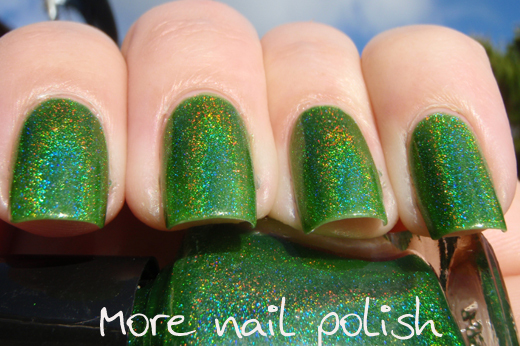 The polish is absolutely gorgeous and we green lovers need it in our lives. You are the frankening queen. 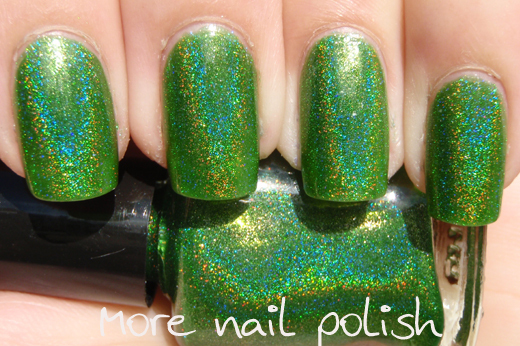 I'm looking for such a green holo!! Such a cool idea, to make a brad new polish out of suspension tints!!! Wow! That is one stunning polish! OMG! 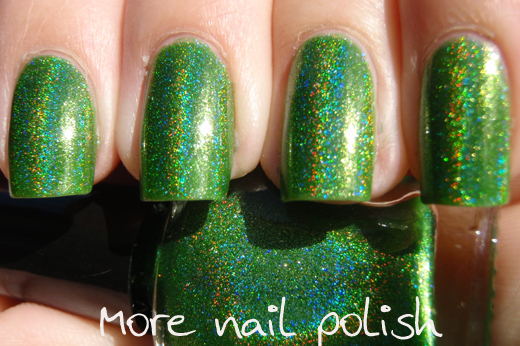 This I the most stunning green holo I've ever seen! I would really love to have this! A good inbetween shade for L8R G8R and Reclaim. Nice! I also agree with KrisInPhilly and Loli :) Please share the name of this company with the suspension base and tints as I'm from Aus and very interested I'm making my own. I've got my bottles ready! I must have missed the info too. I need to clone this hahaha! If I saw that in a way that I was able to purchase it (I am in the US), I would drop everything and buy! That is so beautiful, and one of my favorite shades of green! 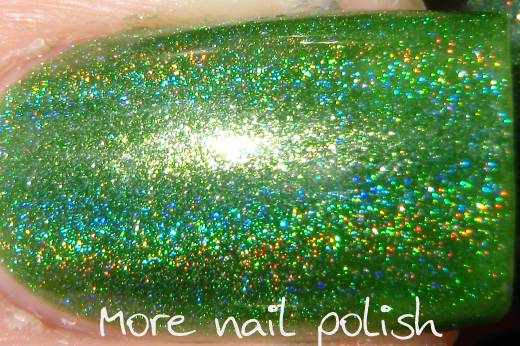 And this is the perfect green holo!! A week later, and I am still thinking about this gorgeous color/holo you mixed up! Is there any way I can pay you to make a bottle and ship to the states, or is the shipping price scary unreasonable/can you not ship the polish overseas? Nikki - I would happily mix you up a bottle/s, but postage would cost me $10.50 for up to 250grams or $17.25 for up to 500grams. If your still interested, send me an email. E-mail sent! Thanks so much!